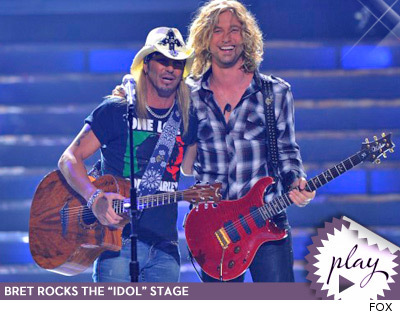 Sure, a new "American Idol" was crowned tonight -- but the other emotional high of the night was when Bret Michaels popped up on stage to sing "Every Rose Has Its Thorn." Michaels was a surprise guest during Casey James' performance of the Poison classic -- and the second he stepped out, the crowd went insane. An insider at the show tells us Bret had the entire audience on their feet the whole song and received one heck of an applause. Bret even stuck around to shake hands with fans in the front during the commercial break. Michaels suffered a brain hemorrhage on April 22 and was briefly hospitalized for heart problems last week -- this was his first live performance since getting out. The Donald to Bret Michaels: You're Hired!